CCCC_2012 165-Miles : Team Aggress! Rich Horn – Second place in the 165 mile event with a time of 6:52, 24 mph average! This is the first year the wind really cooperated, or should I say lack of wind! What a perfect day for a ride. Even though I placed second, my time was 30 minutes faster then the previous course record for the 157 mile event. During the pre-ride expo the night before the race, rumor had it that Brian Folts (Iron Man Triathlete) was talking to everyone saying he was going to win it this year. Mark Goldentyer, who I knew from rides in Saguaro National Park and Mt. Lemmon, came up to me to give me the news. I made a comment: “This is the same Brian that didn’t finish it last year (2011)? I let him get ahead early on as I was trying to rally some of the other riders. Caught him in Benson, pulled away on the steep section of I-10, never saw him again. DNF.” Mark didn’t know that he tried it last year. Just hearing someone being so cocky before a race gets me worked up. I started making claims that he would not win this time. Especially with myself and Mr. McGehee in the event. Don’t get me wrong Brian is a phenomenal athlete, he took first place overall in the Mt. Evens race in Colorado (running) a few months earlier. However most tri’s I’ve ridden with just don’t do as well on the bike so I’m banking this is the same. Never the less, he is only 26 years old, and his cycling equipment is worth about 5 times what my Fuji is. I didn’t get as good a nights sleep as I should have. When the race starts, I told myself I’ll be happy if I finish within 30 minutes of Mr. McGehee, after all he holds world records for 100 mile time trials and is 11 times winner of the 256 mile event. Most important thing on my mind: Make sure that Brian kid does not win! When the gun goes off, more like everyone counting down to zero, we are off on a neutral start till the first cattle guard. After the event gets going, I find that for the first 10 miles it’s myself and a tandem on the front for most of the time. Then we start approaching the gradual climb up to Bisbee. 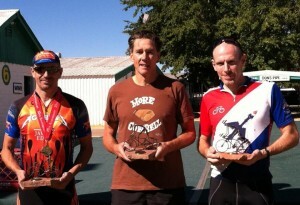 Having recently placed 3rd in Mt Graham, I knew the hill would not be a problem. It was a piece of cake. As a matter of fact our buddy Brian decides to drill it up the hill, every time I’d get on front to help out he would just come past me again. He wanted to set the pace. I was fine with this as he was dropping people every mile. By the time we made it to the tunnel, there were only 4 of us left. 138 miles to go. I was willing to work with these other three (Brian Folts, Dan McGehee and Shane Castle) for the rest of the rice, however Dan was a little perturbed that Brian drilled it up the hill so hard and said he was an idiot and we were not going to wait for him. Three of us raced down the hill and pulled away from Brian with ease. Each time we hit a small climb I made sure I kept the pace up so Brian would not close in. By the Davis road turn off, he was no where in sight. The rest of the race was fairly uneventful. Just after we turned onto I-10 Mr McGehee flatted. Shane rides up to me and said “What a shame, Dan has a flat.” I will kick myself afterward for what I’m about to do. I looked back and then told Shane we have to wait for him. I soft pedaled with Shane for about 15 minutes until Dan got back with us. After we crested the hill near Dragoon, Dan really started his tactful burning of our matches. Every time it was his turn to pull, he would accelerate past the person who just finished their pull (me) and I would have to dig deep every time to catch back on. Somewhere in one of the little podunks about 50 or 60 miles from the finish, Dan wanted me to attack with him and drop Shane. He could not hear me telling him my support was just ahead with my water and I would not attack right now. About 50 yards before my support vehicle Dan attacked, he was talking over his shoulder telling me to go with him. I would not right then because I was out of water and needed the feed. He pulled away. I grabbed my water bottle and stuffed it in the cage. I think Shane made a comment, and there he goes! I jump out of the saddle and said, well I gotta catch him. I was off, and burning some matches. I honestly can’t tell you if it was half a mile or 5 miles, but I caught up to Dan. After I caught back on, he continued his tactful accelerations when I was done with the pull. I knew he was getting ready to drop me because every other time he would try hard to drop me. About 28 miles from the finish he made it clear he was going to finish on his own. He let me do a long pull, then he would start to fall back. He fell back about 50 yards or so, I thought maybe he was trying to take a layer off. Being the nice guy that I am, I slow down to wait for him. While I was not looking he accelerates … I hear the rumble strips as he crossed, I look over my shoulder just in time to see him on the other side of the highway going about 10 miles an hour faster then me. Fooled me this time, no way I can catch him now, especially after a long pull and going blind. I look at the OD and see there is only 28 miles, I tell myself if he gains 1 minute per mile I’ll still reach my goal of finishing within 30 minutes! WooHoo! … uhh … mmm.. Didn’t realize, err forgot, how long riding 28 miles solo, in the middle of no where … feels. Though I was going blind and the legs were fading, I periodically thought I caught the gimps of a mirage ahead. If I squint I keep thinking I see a bike ahead. I knew Dan was gone, so could be riders from the 97 mile event, or just nothing at all. Eventually I did start passing small groups of riders from one of the other events, I figure that must have been what I saw. When I finally come to the finish line, Dan is still on the road. People tell me he just finished. I come to find out he was only three minutes ahead of me. What! @#%$!#^!! Dang, all I had to do was shave 6.5 seconds per mile off the last 28 miles and I would have caught him. I thought Dan was in a class way above me so I kind of eased up after he dropped me. Now to find out I could have easily come back. Lesson learned, next year I’ll play his game my way. He may win, but I’m not going to give it to him again.